MIPA, your state scholastic press organization, supports student achievement and hopes to highlight Missouri’s best and brightest students through our state Student Journalist of the Year competition. Interested in applying for Missouri Student Journalist of the Year? One first step would be to apply to be the MIPA SJOY of the year. On this webpage, you will find the instructions for application. The MIPA SJOY is the longest running SJOY contest in the state, started 50 years ago. It is also the only one with a cash award. Please enter by MIPA’s deadline, which is Friday, Jan. 18, 2019. Once a winner is chosen as the MIPA SJOY, that winner will be encouraged to apply to the Missouri SJOY contest in hopes of moving to nationals. To be eligible for the national level of JEA’s Journalist of the Year scholarships, Missouri students must meet JEA’s national requirements as well as submit a Missouri state application to the JEA State Director Erin Sucher-O’Grady by Friday, Feb. 8, 2019. Director Sucher-O’Grady will appoint a judge to choose the Missouri state nominee to the national level of the contest. Students applying to this level of the contest must have an adviser who is a member of JEA. The winning Missouri portfolio will be sent to the national contest, by the national March 15 deadline. Member MIPA Schools: Every MIPA member high school publication (newspaper/ magazine, yearbook, broadcasting, web or other media) may submit one student entry to the MIPA Student Journalist of the Year competition. There is no cost to MIPA member schools. Meet all national requirements and guidelines. Be a member of a publication which is current MIPA member. Be a senior and have participated in student media for a minimum of two years. 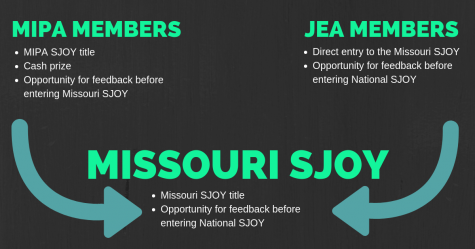 The components of the Missouri SJOY process align with those of the national JEA SJOY process. Have an adviser who is a current JEA member. Please download, complete and upload the PDF file to the online submission form. Official high school transcript or a counselor’s statement including journalism classes take, grades and current GPA. Student should be a high school senior and should have an overall GPA of at least a 3.0 on a 4.0 scale. Action photo of applicant involved in some aspect of student media. Three letters of recommendation from those who know the applicant well and understand the impact of the journalistic experience on the student’s life. No letter should exceed two pages in length. Self-analytical essay: Students should write with passion and make an impact on judges because this essay functions as the applicant’s one-on-one interview with the judges. Essay should not exceed two pages in length. Submit an online portfolio meeting the national expectations. For step by step information on setting up a portfolio look here. No personal information should be included in your online portfolio. This way your privacy will be secure. The URL you provide on the application will be all the judge needs. JEA gives applicants a toolbox to help you. Each work example for the portfolio must be labeled with the applicable category, evidence of usage/publication of example, awards/contests entered and explanation/reasoning for each example. The Explanation/Reasoning may include the applicant’s explanation about the specific assignment. Include any difficulties encountered with the assignment and special circumstances affecting it. Explanation should be 25-50 words in length, easy to read and should explain why this entry is important and was chosen for the portfolio. The applicant’s personality should be evident in the entry. The student should choose a design/concept for the portfolio. See examples of previous national entries. Keep in mind the contest submission process and organization of work examples may have changed since some of these were submitted. Test every document you plan to send. Do they open? Do they look perfect? Does your URL work? Use a non-school email to submit your entry. Many schools limit the size of email attachments students may send. Do not risk yours being caught in a blocker. Friday, Jan. 18, 2019: One student from each MIPA member publication may submit his/her application, supporting documents and portfolio by email to the MIPA SJOY Judge and MIPA office. in January 2019: A complete list of entrants will be posted on this webpage, and confirmation of receipt emails sent to entrants from the MIPA office or contest committee. in January 2019: MIPA’s Judge completes critiques. Submits winner’s name to MIPA contest committee and returns critiques for all entrants to MIPA office. MIPA contest committee will name the MIPA SJOY winner. in January-February 2019: MIPA SJOY winner works with adviser and MIPA office to prepare portfolio for Missouri SJOY competition. Friday, Feb. 8, 2019, or earlier: MIPA SJOY winner submits Missouri SJOY entry to JEA Missouri State Director. in February 2019: The JEA State Director will name a Missouri SJOY winner. By March 15, 2019: The JEA State Director will submit, or help student submit, the entry to JEA for national competition. March 25, 2019: MIPA SJOY winner will be announced and make a short acceptance speech at the annual JDay at Jesse Hall, on the MU campus. SCORING: The state SJOY judge will use the MIPA SJOY Contest Scoring Rubric aligned to the same criteria of the national JOY judges. All categories and possible points are the same between the state and national scoring rubrics. 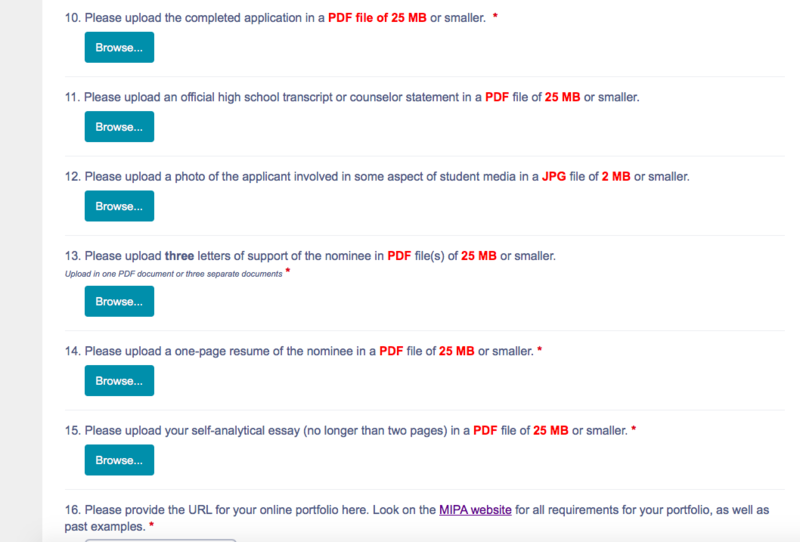 The only difference is the addition of spaces for judge’s feedback to be made to the student applicant. It is the hope this feedback will assist the state winner in making any revisions prior to applying to the national Student Journalist of the Year contest. 2019 JUDGE: JOE HUMPHREY, MJE, advises newspaper, yearbook and online media at Hillsborough High School in Tampa, Florida. He is evaluations coordinator for the Florida Scholastic Press Association and a member of the Journalism Education Association Certification Committee. Humphrey was local team chairman for the Fall 2015 National High School Journalism Convention in Orlando. STATE WINNER: The MIPA SJOY state winner will be notified in late-January. S/he will be given time to review the judge’s comments, make revisions where needed, and submit his/her Missouri SJOY application to the JEA State Director Erin Sucher-O’Grady. The same materials may be used at both state levels of the contest. If chosen as the Missouri SJOY, the applicant will need to submit the JEA national application and follow those requirements and guidelines for submission. $2,500 scholarship – Missouri School of Journalism – MU proudly continues the tradition of offering a scholarship to the MIPA SJOY, should the winner choose to attend the university. MIPA Judges Fund – this fund was set up with donations from MIPA Judges for the purpose of supporting scholastic journalists. Since 1969 this MIPA, your state-wide program, has honored student journalists from all over the Show Me State. All of these honorees were submitted for consideration in the Journalism Education Association’s High School Journalism Student of the Year.